José Luis Ortín Romero is a partner in the corporate law & M&A practice with a focus on financial services industry and private equity sector. 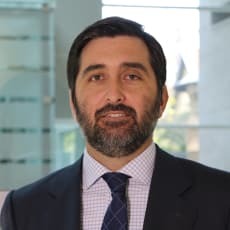 He is a regular adviser to top-tier international investors and fund management entities in their investments in Spain (including in the infrastructure, logistics, energy, education and financial sectors) and Spain-based management companies, both in the M&A activity of the funds as well as the fund structuring and fundraising process by such management companies. He is a member of the Garrigues private equity multidisciplinary group taking part in numerous seminars and industry analyses. The Best Lawyers directory has highlighted his activity in the area of corporate and M&A Law for the last three years. In 2017 he was awarded the ‘40 under Forty’ award by Iberian Lawyer. Iberian Lawyer’s 40 under Forty awards honour the leading 40 lawyers across Spain and Portugal under the age of 40. He is admitted to practise law in Madrid and New York.